With over 2 million in-person dates, everyone’s talking about It’s Just Lunch. Unlike most dating services that make you pay monthly to find your own matches, connect online, set up a date, and confirm it. It’s Just Lunch takes care of pretty much everything so the only work you have to do is sign up. It’s Just Lunch works much like a recruiting company, and you’re the one looking for love. You’ll start off by speaking personally with a matchmaker about what you’re looking for and what you’re not. Then they get to work searching for some compatible matches to set you up on a date based on their matchmaker’s skills and intuition. You’ll get a phone call describing a potential match to you, and you can either reject it or give it the OK. They only give out first names to keep your personal information confidential. Dates can be set up for lunch, after work drinks, or a weekend brunch, and you don’t even have to worry about contacting the date to make sure they’re going – It’s Just Lunch confirms the date with both parties. Afterwards, they ask for feedback to see if the date went well, or to make adjustments for future matches. Seems simple, hassle free, and guaranteed to have real life dates. Although everyone is talking about It’s Just Lunch, it’s not all positive. One of the biggest problems is the incredible cost. Prices can be a bit of a mystery, but expect to pay over $2,000 for a year-long membership. Ouch. However, if you’ve got a successful job and don’t have time for the hassle of dating logistics, 2k could easily be worth the cost if the matchmaking really works. But does it? Consumer Affairs reviews certainly show it does – with over 3,000 reviews, most of which are positive, it seems like most people walk away feeling satisfied. But something’s fishy about the reviews. The star rating is only based on 1,269, most of which were made between 2013 and 2016. Going back to 2011, most of the stars disappear, and you’re left to wonder what happened to the ratings, especially since the actual commentary seems negative. As it turns out, It’s Not Just Lunch varies greatly depending on location. The franchise has local offices, and each one performs a bit differently. Some have even gotten an F from the BBB. Overall, It’s Just Lunch has an A-, but before choosing the service, definitely check the BBB’s rating for your local It’s Just Lunch office. That might be understandable (your service is only as good as your individual, local matchmaker), but what’s really disconcerting is the class action lawsuit that was filed against It’s Just Lunch in 2007. The lawsuit had several claims that put this company in doubt. • It’s Just Lunch promised to try to meet their client’s desires when setting up dates, the matchmakers were more driven by monthly quotas than actual preferences. • Many people doing the matchmaking had little or no training in matchmaking. • Services were misrepresented in New York, and the company broke New York’s state law (dating services cannot charge more than $1,000 in New York). 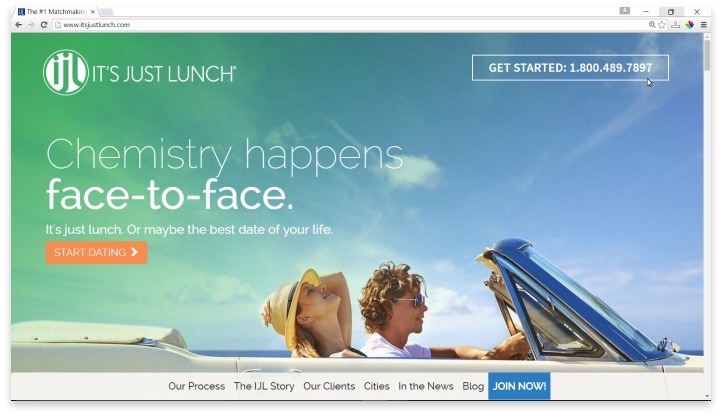 The lawsuit was finally settled in 2016, with It’s Just Lunch agreeing to pay $60 million in vouchers and 4.75 million in cash, add a consumer pledge, and edit their contracts to better meet their client’s dating preferences according to Top Class Actions. It's Just Lunch takes care of pretty much everything so the only work you have to do is sign up. Some people obviously like It’s Just Lunch, and now that the class action lawsuit has been settled, their quality of service and standards will hopefully improve. However, given the severity of the complaints and the amount of money at stake, it might be better to take your business elsewhere. If you do decide It’s Just Lunch sounds like a good option, make sure to check your local business’s rating with the BBB first. Have you had an experience with this company? Please share your It’s Just Lunch reviews below.